The College Herbarium (now the Ada Hayden Herbarium) is established. Today, the more than 600,000 specimens of plants and fungi allow researchers to conduct taxonomic studies and identify unknown plants. Recently, they have been used as a source for molecular studies and to support biodiversity research. Iowa State expands its agriculture work, spending $300 for the purchase of a Durham bull, "Oneida Prince," and devoting ten acres of cropland to experiments run on five different wheat varieties. The total yield is 141 bushels and is valued at $137.39. It is grown at a cost of $76.37. The Agriculture Experiment Station is established (today the Iowa Agriculture and Home Economics Experiment Station). IAHEES research – from modifying hen diets to reduce egg facility emissions to pioneering the use of ultrasound technology to improve biorenewable fuel production – is one reason why Iowa State is among the nation’s leading universities in transferring research and technology into commercial uses. Iowa State begins conducting seed research. Today, the ISU Seed Laboratory is the largest public seed testing laboratory in the world. The Seed Lab leads research in seed physiology, pathology, and conditioning and providing testing of more than 300 seed species. The lab developed and refined the tray cold test for vigor, which has served as an industry standard for more than 30 years. Between 1850 and 1950, hog cholera accounted for 90 percent of all pig deaths. Until 1905, it was believed that bacteria caused hog cholera. Iowa State veterinary researchers and USDA researchers discovered that it was in fact caused by a virus, in turn producing the live-virus hyperimmune vaccine that successfully controlled the disease. 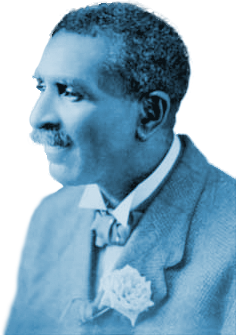 The Engineering Experiment Station is created by Anson Marston, first dean of engineering. It supported research in the emerging areas of science and technology, and transferred those results to the state's industries. 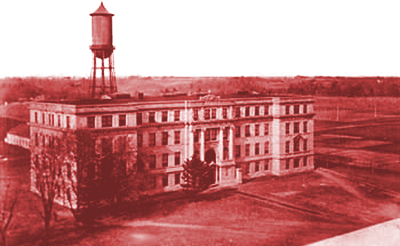 Today, the Center for Industrial Research and Service (CIRAS) follows a similar mission as the industrial extension arm of Iowa State. The cost of living index – which evolved into today’s Consumer Price Index – was developed by Iowa State economics researcher Elizabeth Hoyt. The CPI is one of the most widely used indexes of the effect of inflation on cost of living. The Chieftain apple, a cold-hardy cross of Jonathan and Red Delicious apples, is created at Iowa State. Chieftain apples have a balanced sweet and tart flavor, popular for both cooking and eating fresh. Iowa State establishes its first research farm, the Northern Research and Demonstration Farm (near Kanawha, Iowa). Today, Iowa State has 15 research and demonstration farms dedicated to testing for climate, soil, or crop problems. They serve as models for fellow farmers in innovative agricultural practices. The Cooperative Wildlife Research Unit was born at Iowa State, becoming the model for wildlife research units at universities across the nation and leading to new state and federal programs and policies. Research at the Iowa Cooperative Fish and Wildlife Research Unit focuses on natural resource conservation and management. The Statistical Laboratory is born, with faculty establishing new and improved statistical methods for scientific application that are still used around the world by researchers in various disciplines. The Stat Lab’s Survey Section evolved into today’s Center for Survey Statistics and Methodology (CSSM). 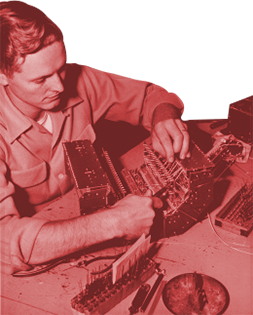 Computers today continue to be built on many of the basic tenets that originated with the world’s first electronic computer, created at Iowa State in 1937. The Atanasoff-Berry Computer (ABC) was developed by physics professor John Vincent Atanasoff, who wanted to increase the speed and accuracy of scientific calculations. The ABC is a binary system of arithmetic, separation of computer and memory functions, and regenerative drum memory. 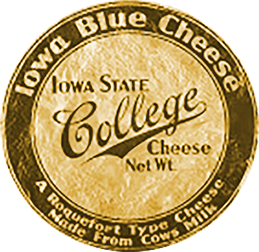 What is now the industry standard for blue cheese processing was developed at Iowa State. ISU food chemists were working on a recipe for blue cheese using cow’s milk rather than the traditional sheep’s milk when Maytag Dairy Farms approached the ISU dairy science department, looking for ways to produce more than milk from their herd. 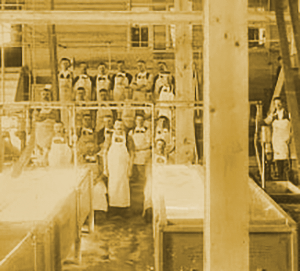 Maytag eventually adopted Iowa State’s process, and their award-winning Blue Cheese began to be manufactured in 1941. A uranium purification method necessary for a self-sustaining atomic reaction was developed at Iowa State, dubbed the Ames Project. The team of chemists produces more than 2 million pounds of high-purity uranium metal for the Manhattan Project, which produced the first atomic bombs during World War II. The Ames Project becomes the Ames Laboratory, to this day the only Department of Energy national laboratory on a university campus. Ames Lab and Iowa State’s partnership has led to many groundbreaking discoveries over the years, from designing synthetic molecules for direct solar energy conversion to developing a remote-controlled analysis system to analyze samples from hazardous waste sites. Stat Lab researchers develop the procedures used in the 1958 Conservation Needs Inventory of soil resources across the nation. The process allowed the Soil Conservation Service to make informed decisions about grazing, forest production, and wildlife, and more broadly influenced policymaking and program management. Ever since, the Stat Lab has partnered with USDA to conduct research and implement statistical methods for what is today known as the Natural Resource Inventory. The Ames Laboratory Reactor, one of the largest nuclear reactors in the nation dedicated to basic research, begins operations. The reactor is shut down in 1977. 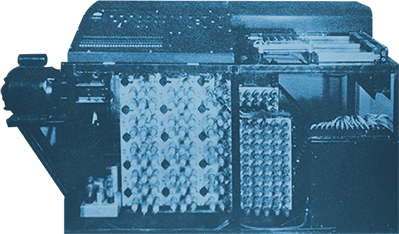 Built during post-World War II computer development, the Cyclone Computer was 10 feet tall, 12 feet long, 3 feet wide, and contained more than 2,700 vacuum tubes. It inspired many theses and dissertations on computing in the 1960s up until its retirement in 1966 after 10 years of modifications and improvements. Professor Wes Buchele is awarded a patent for a machine he invented in 1966 alongside grad student Virgil Haverdink: a baler that produces large, round bales of hay that can be moved by tractor. Today, nearly all of the world’s hay is collected using the large round baler. The encoding process used in nearly every fax machine is developed by an ISU grad student. David Nicholas patents the process and Iowa State licenses the technology to 24 fax machine manufacturers, generating about $5 billion in fax sales worldwide between 1985 and 1990 and more than $36 million in income for Iowa State. It was Iowa State's highest-earning patent until 2011 (see "Taking Out the Lead Pays Off"). The B73 line of hybrid corn is developed by ISU and USDA scientists. B73 and other B-lines helped increase corn yields by 60 percent and also offer significant improvements in plant resiliency. B-lines are round in the lineage of more than 45 percent of today’s corn hybrids, grown on tens of millions of acres and valued at billions of dollars worldwide. A kennel cough vaccine for dogs and swine is developed and patented by Iowa State professors William P. Switzer and Daniel O. Farrington. 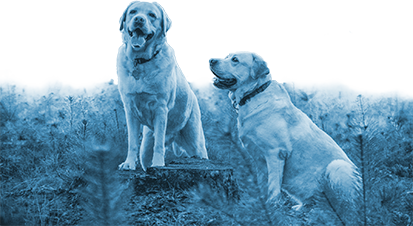 Kennel cough is a highly contagious and common respiratory disease among dogs, affecting most at least once in their life. An analysis tool developed at Iowa State nearly two decades prior identified the poison in Tylenol™ pain medicine that caused seven deaths. Research in inductively coupled plasma spectroscopy led to the analysis tool, which is now standard in thousands of laboratories worldwide. It was developed by Velmer Fassel, professor and Ames Lab deputy director, in 1966. ICP instruments rapidly determine almost all elements to the parts per trillion level in substances such as oil, blood, and soils. Extension and the Department of Sociology partner to launch the Iowa Farm and Rural Life Poll, an annual survey of Iowa farmers. The Farm Poll provides a better understanding of how ongoing changes in Iowa’s agriculture and rural areas affect farmers and rural society as a whole. 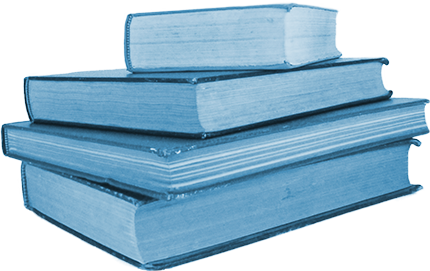 Information helps guide policy decisions and actions. The Center for Nondestructive Evaluation (NDE) opens, becoming a research leader in methods for aircraft inspection. NDE has a long history of developing cost-effective tools and solutions for aerospace, defense systems, energy, infrastructure and transportation, and petro-chemical industries. The Leopold Center is established, a research and education hub focused on funding and supporting statewide programs that develop sustainable agricultural practices that both turn a profit and conserve natural resources. The Leopold Center has earned a national reputation for its cutting-edge research that has led to cleaner water, better natural resource conservation, and greater agricultural vitality in Iowa. One example is the development of hoop barns as an alternative to typical hog confinement systems. 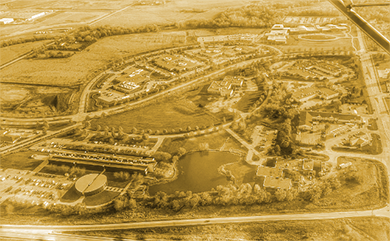 The Iowa State University Research Park (a 230-acre development) is founded to provide space and resources for technology-based firms and research organizations. Breakthroughs that have taken place at the Research Park include development of an ebola vaccine, secure cloud-based financial reporting and genome editing in commercial crops. PrISUm, a student-led team that builds and races solar cars, forms. It is the longest-running solar car team in North America. PrISUm members have used the latest in solar-energy, mechanical, electrical, and other areas of research to build 13 award-winning solar vehicles that they race in national solar car competitions. The Iowa Energy Center was established by the Iowa General Assembly to provide renewable energy and energy efficiency to Iowa citizens, building professionals, and educators. The Iowa Energy Center was administered through Iowa State University until 2017, when it was transferred to the state of Iowa. The Center for Building Energy Research (CBER) is founded, a cooperative effort between the Iowa State's mechanical engineering and architecture departments. CBER conducts energy efficiency research, developing innovative building strategies and technologies. Recent research efforts include a passive solar home that uses building design for climate control, and a project combining data-driven science and community engagement practices to create sustainable cities. Iowa State researchers develop a new soybean variety. It was patented and sold to Pioneer Hi-Bred International Inc., which produced LoSatSoy, the world’s first low satured fat soybean oil. It has one gram of saturated fat per serving, half the amount found in traditional soybean oil. Iowa State is the first university in the nation to build a linear accelerator to learn how irradiation can be used to destroy foodborne pathogens like salmonella and E.coli. The commercial-sized facility is used by 230 companies, organizations, and researchers to test irradiation on different foods and to train operators. Research has shown the technology to be highly effective in destroying the bacteria that cause many kinds of food poisoning. The Energy Resource Station (ERS) opens, the first facility in the nation designed to test and demonstrate multiple full-scale commercial building HVAC systems. The impact of ERS research is felt across Iowa, saving building and business owners money and energy, reducing pollution levels in our communities, reducing Iowa’s dependence on imported energy, and more. Lead-free solder, developed by a team led by Ames Laboratory senior metallurgist Iver Anderson, is patented. It made history as the first cost-effective, broadly useable alternative to tin-lead solder, a toxic but necessary ingredient in a range of electronics. The technology was licensed by more than 50 companies in 13 countries — and made history again in 2011 (see "Taking Out the Lead Pays Off"). C2, a virtual reality environment, opens and is one of the world’s most advanced virtual reality rooms. In 2000 the C6 opens, becoming the country's first six-sided virtual reality room. In 2006, the entire facility has a technology refresh, making the facility the highest resolution environment of its kind, with over 100 million pixels. 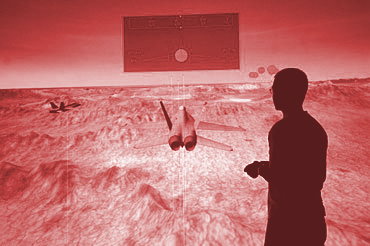 Research includes 3-D sensing techniques, a helmet to communicate with soldiers from afar, intelligent tutoring systems and more. The Plant Sciences Institute’s (PSI) research on plant genomics and bioinformatics takes off, leading to discoveries in accelerating plant breeding, detailing the genetic mechanisms that govern growth and drought response in plants, and more. The Livestock Infectious Disease Isolation Facility opens, serving as a contained space to safely conduct infectious disease research. The 20,000-square-foot facility allows scientists to expand their food safety research on salmonellosis and E. coli infections, in addition to developing new vaccines and better diagnostic tests. Iowa Energy Center’s Biomass Energy Conversion Facility (BECON) opens, allowing Iowa State researchers to scale up new biobased processing methods with BECON's industrial-scale equipment, speeding the move from laboratory to market. Biomass fuels can be used to generate electricity, heat, and valuable byproducts. The Bioeconomy Institute (BEI) is launched to lead Iowa State’s interdisciplinary biobased-energy research. BEI scientists have made key advances in thermochemical technologies to produce fuel from biomass. Now, BEI researchers are developing carbon negative energy, a subset of greenhouse gas removal technologies, based on biomass pyrolysis and biochar sequestration. They are also working in advanced manufacturing to explore intensification and modularization of chemical reactors for processing waste resources. Iowa State researchers build the nation’s largest tornado simulator to study how tornado winds damage buildings in their path. Results from the simulator help researchers develop construction improvements that help homes stand up to big winds. The Center for Excellence in the Arts and Humanities is established to promote excellence in research and creative scholarship in the arts, design, and humanities at Iowa State. 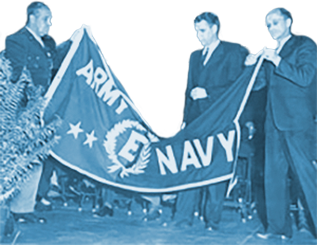 Recent research efforts supported by CEAH include studying the values of historic preservation versus new design and construction, analyzing the role that women played in the development of radio and TV broadcasting in the U.S., and researching the development of the resistance to the draft during the Vietnam War. Anthropologist Jill Pruetz’s discovery shocked the primatology world: Chimpanzees in Senegal were making and using spears to hunt other primates. The breakthrough offers clues to the evolution of tool technology among the earliest humans. 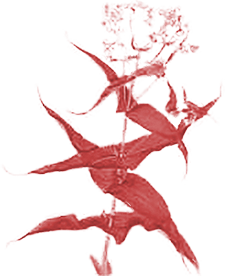 The Center for Biorenewable Chemicals (CBiRC) is founded. 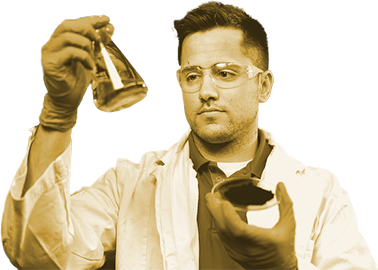 The CBiRC is a National Science Foundation Engineering Research Center that focuses on reducing society’s dependence on fossil fuels by deriving value-added chemicals from renewable carbon sources. Recent successes include creating four biobased molecules and testing product possibilities and establishing six start-up companies to take biorenewable chemicals to market, among others. Iowa State researchers make key contributions to the first sequencing of the corn genome. Understanding the corn genome opens new doors for scientists to help corn plants withstand climate change, add nutritional value to grain, and sequester more carbon in the soil and boost yields. The BioCentury Research Farm opens, the first farm in the nation to integrate research and demonstration in a facility dedicated to biomass production and processing. The first research project studied the effectiveness of drying trailers to remove moisture from biomass. From 2009 to 2015, the farm processed nearly 80 tons of biomass feedstocks for on- and off-campus clients. Iowa State animal scientists were leaders in the first-ever sequencing of the swine genome, which led to both improvements to pork products and an animal model that may yield new information important to human health. The Institute for Transportation (InTrans) is founded, bringing many of Iowa State's transportation research programs, partnerships, and projects together under one umbrella — and providing the launching pad for new transportation initiatives. Research includes developing a system to reduce the duration and impacts of traffic incidents, improving the support system under concrete pavement, and more. 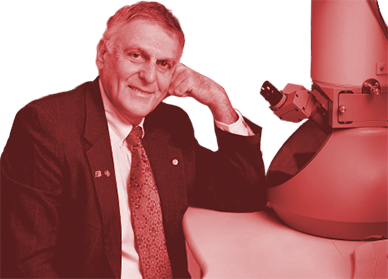 Iowa State and Ames Laboratory materials scientist Dan Shechtman receives the Nobel Prize in Chemistry for his discovery of quasicrystals, a paradigm-shifting discovery that changed the way chemists and material scientists view crystals. Shechtman first observed quasicrystals in 1982, seeing five-sided patterns of atoms that never repeats themselves though his electron microscope. His discovery was so controversial that it took decades of defending his findings for fellow scientists to accept that quasicrystals exist. Today, quasicrystals have been both created in labs and found in natural materials, and their hardness and non-stick qualities may find use in strong steels and surface coatings. The proceeds from the patent for lead-free solder overtake those of the 1970 fax algorithm, making it the highest-grossing patent in Iowa State's history. Royalty income totaled nearly $60 million before the patent expired in 2013. Ames Lab researchers continue to develop different varieties of lead-free solder and other advanced materials for use in next-generation energy technologies. Iowa State’s Veterinary Diagnostic Laboratory is the first to identify, diagnose, and sequence porcine epidemic diarrhea, a devastating disease affecting swine. By February 2014, more than 100 new cases of PED virus had been reported each week, and the virus had spread to swine farms in 23 states within a year. Iowa State animal scientists complete the first DNA sequencing of a purebred beef breeding herd in the nation. The genetic information is used to improve both meat quality and animal health. The Midwest Big Data Hub forms, an Iowa State partnership with other universities and organizations designed to harness the power of large data assets to address societal challenges facing the Midwest and drive regional economic development. Researchers develop techniques for collecting, managing, mining, storing, and analyzing the huge and complex data sets created by today’s research, government, and commercial activities. The Center for Statistics and Applications in Forensics Evidence (CSAFE) is formed at Iowa State. Researchers create solutions that quantify the uncertainty, limitations and errors associated with human factors; pattern evidence, such as fingerprints and bullet marks; and digital evidence, such as data from cell phones and computers.